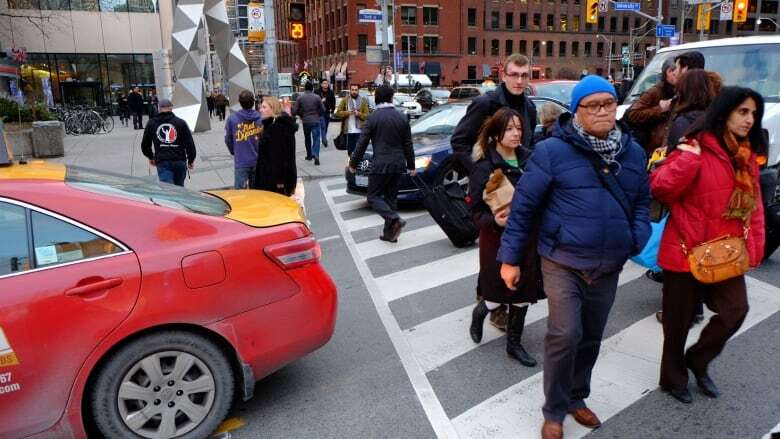 In a city where gridlock is a major political issue, Toronto police rarely hand out tickets to motorists who block busy intersections, CBC News has learned. Police don't publish the numbers, but a freedom of information request found that the force has filed fewer than 300 tickets for blocking intersections in the city in the last five years — a number that will seem low to anyone who has spent any time observing traffic at busy Toronto intersections. In 2013, police didn't issue a single ticket to a motorist for failing to clear an intersection that has traffic signals. By May of 2015, however, Toronto police had handed out 103 tickets for the first five months of the year — each of which costs the driver $115. That number represents a big jump, but it's still less than one ticket per day in a city where it's common to see vehicles blocking intersections, especially during rush hour in the downtown core. Mayor John Tory specifically addressed the drivers of those vehicles in a video posted on the police website, telling them: "You may think just getting into the intersection is going to speed up your commute, but it's going to cause gridlock. "And we're fighting gridlock right now." Const. Clint Stibbe, of Toronto police's traffic services division, admits the number appears low. "Does it happen? Yes it does. Is it a problem for the city? Absolutely," Stibbe told CBC News. He says the recent jump in tickets issued over the past two years might have something to do with one police division focusing on vehicles blocking intersections. But Stibbe said it's difficult for police to crack down on the offence. Officers have to pull over those who block intersections if they want to write them a ticket — something that would slow traffic even further. Further, red light cameras don't capture the offence, Stibbe said, and there's also the possibility that offending motorists get hit with other tickets like making a prohibited turn. Stibbe also points out this is more than a cops-versus-drivers issue, as blocked intersections and sidewalks also put pedestrians at risk. Often, he said, cars will wind up blocking a crosswalk, which puts pedestrians in jeopardy as they're forced to choose between walking out into traffic behind the car or squeezing in front where they may get hit if the car moves forward. 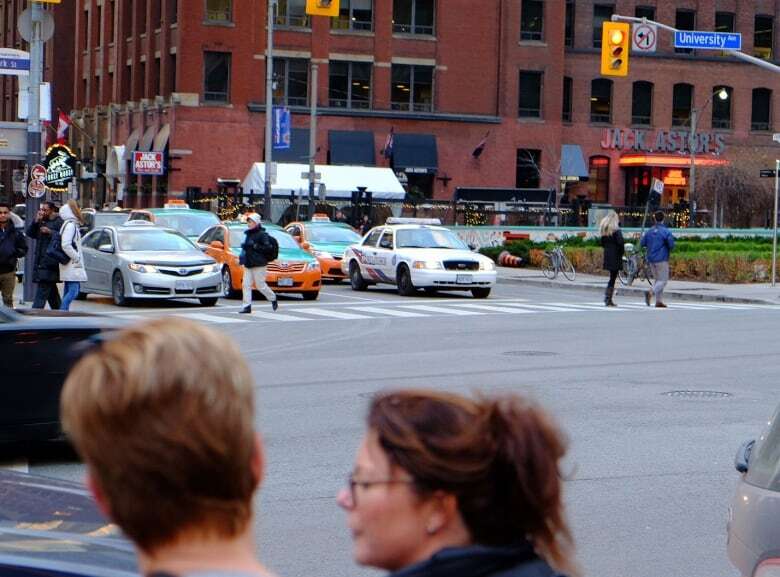 There is a "tremendous number" of pedestrian collisions downtown, Stibbe said, and vehicles blocking intersections are a contributing factor. Toronto police say it's difficult to crack down on gridlock, as pulling drivers over only adds to congestion. (John Rieti/CBC)Stephen Buckley, general manager of the city's transportation services division, said the city has noticed the issue, but that it appears to be individual incidents rather than "pervasive bad behaviour." Often, Buckley said, major delays somewhere up the road — like the ongoing Gardiner Expressway construction work, for example — create the conditions for gridlock at intersections like Front and Spadina as commuters all try to funnel onto the highway at the same time. Some frustrated drivers, he said "push it further than they should," by aggressively entering the intersection on yellows and getting stuck. Each incident, he said, can delay dozens of cars. However, Buckley said if motorists waited until they were completely sure they could make it across intersections that may also slow the flow of traffic, particularly near wide intersections like University Avenue. Both Buckley and Stibbe said it's largely up to drivers to cut down on the number of blocked intersections. However, Buckley said the city is considering a pilot project that could station officers at some problematic intersections with the goal of keeping traffic moving. Stibbe said police would take something like that on at a divisional level. Tory, meanwhile, recently told a gathering at the Economic Club of Canada that he's still focused on easing the city's traffic woes. He said "traffic bottlenecks" are largely to blame for the gridlock conditions.